Woke around 0530 by a great stomping of feet overhead, clearly this was cj's method of waking us. Leapt out of bed only to discover that it was way too early to get up and that the noise rather than being cj trying to rouse the house, was instead just rosemary quietly heading to the bathroom, rolled over and tried to go back to sleep. Up and dressed about 0630 and off to the parking lot in front of the main building to once again board our safari vehicles. Got in the same one as yesterday and very pleased to once again be issued with blankets, this despite the fact that we were already wearing every piece of clothing we owned. Reserve gate even more intimidating in the pre-dawn hours, this time we were definitely going to be a eaten by velociraptors. 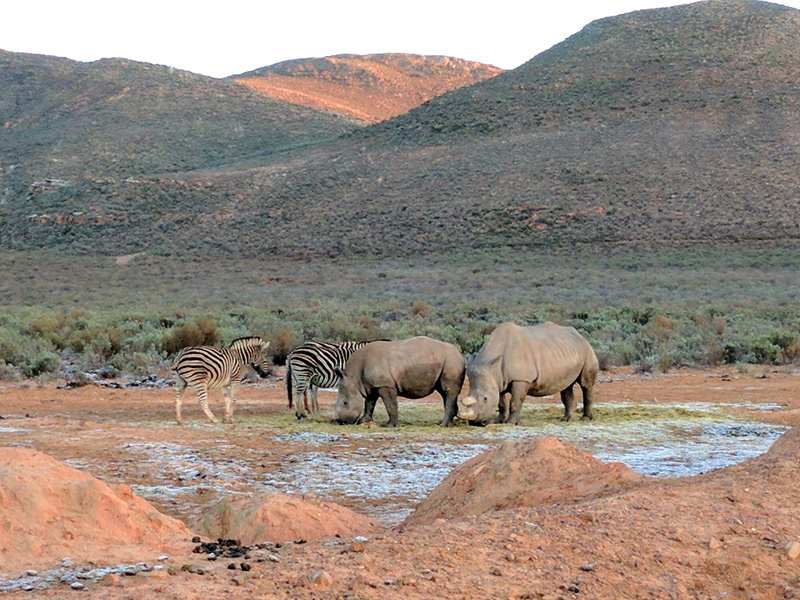 The weather in South Africa was unlike anything we ever encountered. Despite being winter, the sun was really intense and always really warm, but the air itself was freezing cold. As a result in the early morning hours before the sun climbed high enough to actually shine on us we were extremely cold so huddled under our blankets as we set off across the reserve despite the fact that we knew we'd be walking around without coats later in the day, there was frost on the ground. 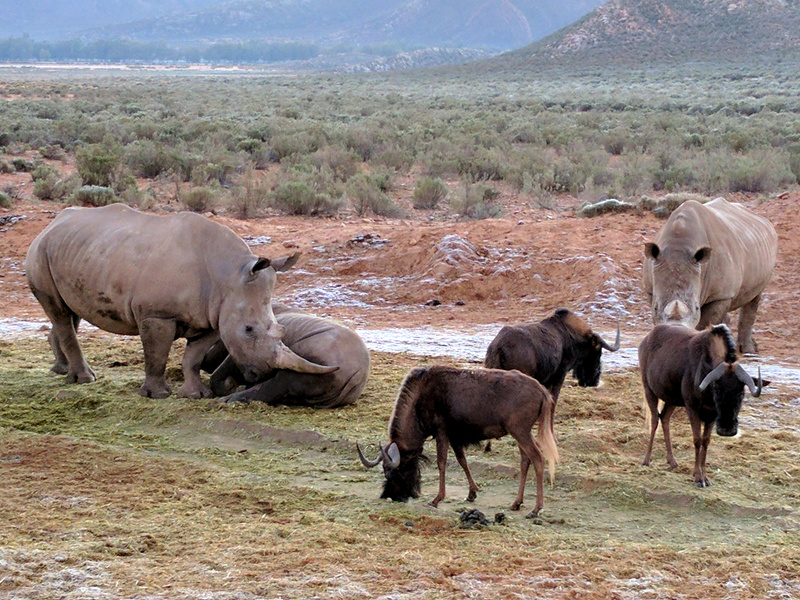 There were wildebeest 2 links hanging out around the rhinoceros 2 links. It soon started to become lighter as the dawn broke. 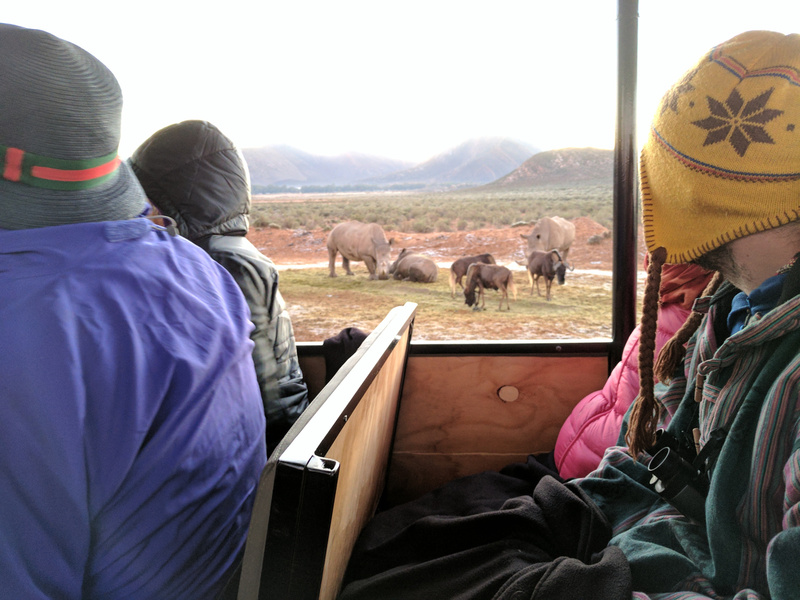 When we'd boarded the vehicle I'd inquired as to whether or not there were any giraffe on the reserve and if so would it be possible to find them so when we were done with the rhinoceros we set off to the other side of the reserve to see if we could find any. Took a shortcut through the lion enclosure and since the lions were actually down in the hollow instead of up in the hills, loitered for awhile to watch them. Passed a broken down safari vehicle just outside the gates, those people were totally going to be eaten by the velociraptors! Took a shortcut through the lion 3 links enclosure. 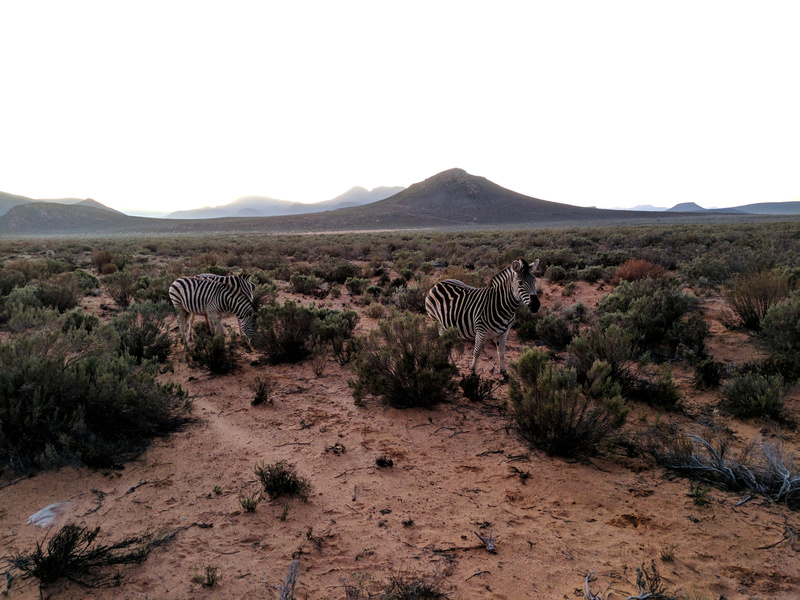 Came across springbok 2 links on our way to see the giraffes. 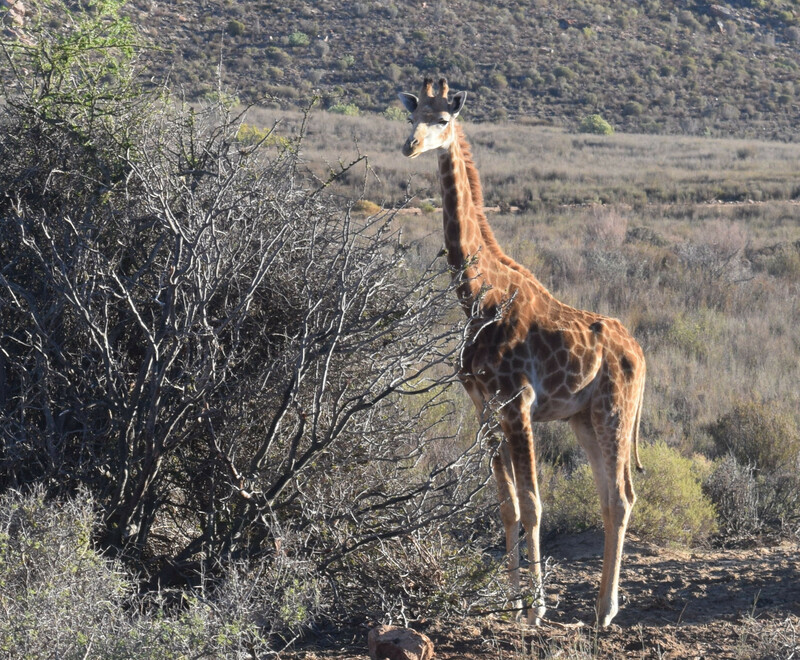 While you would expect giraffes 3 links to be very easy to spot, with their long necks, they turned out to be nearly impossible to distinguish from the land around them. This even after our guide pointed them out to us. There's no way there's a giraffe there and yet as we got closer we discovered that he was right, there was a giraffe there! 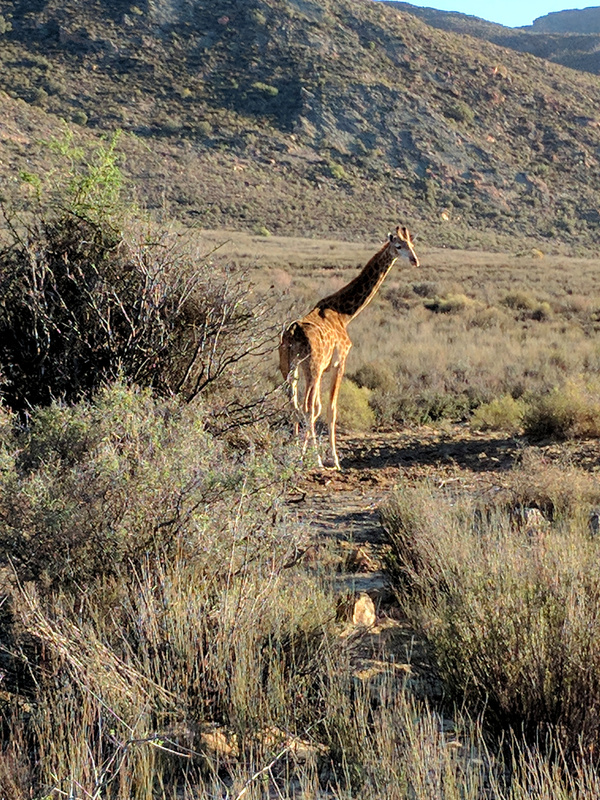 Apparently this particular giraffe was somewhat skittish and liable to take off if we attempted to get to close so our guide inquired as to whether we were willing to take a short walk? Yes! Followed behind him single file as we wound through the feynbos, far too cold for snakes but I wasn't taking any chances, went out of my way to step only where our guide had stepped. Surprised to find that the giraffe wasn't anywhere as tall as I'd expected him to be and at 27 years old, it wasn't that he was a baby. 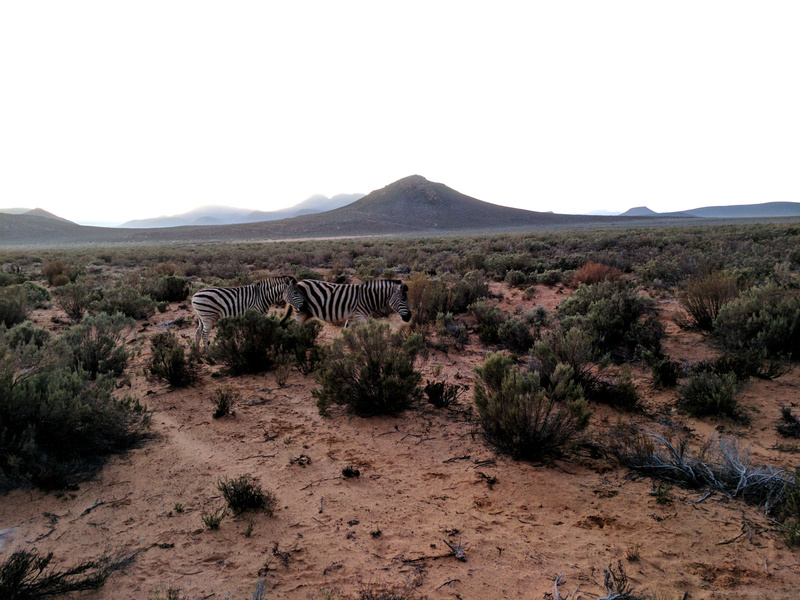 Followed behind him single file as we wound through the feynbos. They turned out to be nearly impossible to distinguish from the land around them. Headed in when we were done with the giraffes, we were the last vehicle back and only an hour to eat breakfast and check out. Everyone else prioritized breakfast but in an effort to warm up I opted for a quick shower and clean clothes first.